The government appears worried about a growing Taliban presence near its border. The government of Turkmenistan is taking unprecedented steps to lock down its border as Taliban forces appear to have taken up positions very close to Turkmenistan’s territory. The move comes amid heightened fears about the looming pullout of U.S. and NATO forces from Afghanistan and whether it will threaten the security of Afghanistan’s northern neighbors in Central Asia. The threat of “spillover” of instability from Afghanistan has been heavily hyped for some time, particularly by the governments of neighboring Tajikistan and Uzbekistan. While the leaders of those countries have genuine fears of radical Islam in their countries, they also cynically use the threat of Islamism to justify harsh crackdowns on political opposition of any stripe and to attract support from abroad. Turkmenistan, however, had been different. Reclusive and avowedly neutral, it does not depend on foreign aid. And Ashgabat had a cordial relationship with the Taliban when they ruled Afghanistan in the 1990s, working on a gas pipeline that was ultimately never built while Tajikistan and Uzbekistan supported the rebel Northern Alliance. There are close to a million ethnic Turkmens in Afghanistan, generally across the border from Turkmenistan in northwestern Afghanistan. And until recently, they had moved back and forth relatively freely and to a greater degree than Tajiks and Uzbeks, who also live on both sides of the Afghanistan border but have little contact with one another. Over the last few years, however, the Taliban presence has been growing steadily in the provinces that border Turkmenistan, in particular Faryab and Jowzjan. And earlier this year, the Turkmenistan government began to take action after several of its border guards were killed in a clash with Taliban forces. Turkmenistan started reinforcing the border and holding military exercises near the Afghan border. In September, Turkmenistan troops even had crossed into Afghan territory and built defensive structures like trenches and fences, according to a report on the Turkmen-language service of Radio Free Europe/Radio Liberty, which has been closely following the story. And according to a new report on October 10, Turkmenistan has now begun more heavily reinforcing the border and manning it with elite special forces. Starting in 2015, U.S. and NATO forces in Afghanistan will be substantially reduced, from about 41,000 today to fewer than 15,000 on January 1. And those troops will not directly be involved in combat missions, but will train and advise Afghan forces. The China-led Shanghai Cooperation Organization and the Russia-led Collective Security Treaty Organization both have positioned themselves as stabilizing forces in Central Asia after the Western withdrawal (and the CSTO has promised Tajikistan aid to secure its border with Afghanistan). 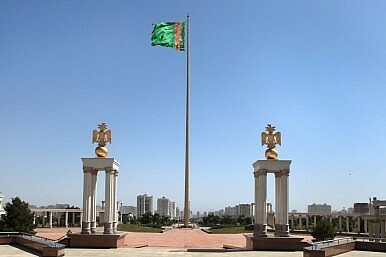 Turkmenistan is not a member of either of those organizations, however. There is still little reason to believe that the Taliban pose any sort of threat to Turkmenistan. They have evinced no interest in expanding into Central Asia, and even if they were to take power in Afghanistan it is unlikely that they would want to create international crises for themselves by fomenting chaos in their neighbors. And Islamism so far has failed to take root at all in Central Asia. While there has been a post-Soviet revival of Islam in Central Asia, religion – especially radical political Islamism – is still a very weak force there, thanks in large part to decades of Soviet state-enforced atheism. So the Taliban’s message, even if they were to try to promote it in Turkmenistan, would likely fall on deaf ears. Nevertheless, it appears that the government in Ashgabat is taking no chances. All Quiet on the Turkmen Front? What is happening on the border? It's decidedly more than nothing. Taliban Stuck on an Island Between Afghanistan and TurkmenistanWhat is Uzbekistan’s Role in the Afghan Peace Process?How Concerned Is Turkmenistan About Its Afghan Border?Understanding Turkmenistan’s Food ShortagesWhat Happened on the Afghan-Tajik Border?